The very popular mobile game "Angry Birds" has set another new level of game-play that surely everyone will enjoy. I watched the posted angry birds video game-play in the Samsung Mobile Youtube channel last week. Actually! I read the description of the said video, it said, "For all Samsung GALAXY users, an exclusive Samsung GALAXY Note level will be provided in the Angry Birds Space game." 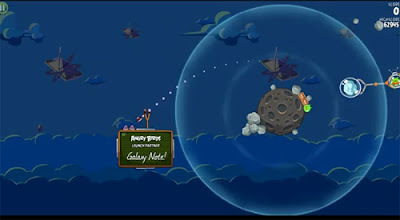 The Angry Birds Space is set to launch on March 22, 2012 together with the exclusive offer to all Samsung GALAXY users. Added to its post, "In addition, "Danger Zone", a special package of 30 challenging levels normally available as an in-app purchase, will be made available for free to all Samsung GALAXY users from Samsung Apps and the Android Market (level pack compatible above Android 2.1) for 3 months. " Meanwhile, Angry Birds Space will also available in iOS, Android, PC, and Mac platforms this coming 22nd of March. Comments or suggestions about "Angry Birds in outer Space" is important to us, you may share it by using the comment box below.